THIS IS FOR THE CARD PICTURED ABOVE IN THE CONDITION AS STATED. Jevon Kearse. Card # 143. Cards will be securely protected in a penny sleeve, put in semi-rigid plastic saver. This card is Near Mint-Mint (NrMt-Mt) or Better. All corners sharp and CENTERED with no creases. THIS IS A LOT OF 28 JEVON KEARSE CARDS IN EXMT/NRMT/MT CONDITIONS. 1999 Coll. Titans Rookie RC. '99' Leaf Football KEARSE Rookie card in NRMT/MT condition. Check scan. You will receive the exact card shown in the scans. 2004 Absolute Memorabilia Tools of the Trade #TT42 Jevon Kearse 66/75 Mint!! 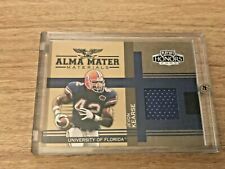 Jevon Kearse 2005 Playoff Honors Alma Mater Materials Florida Gators! Titans! Awesome 2001 Topps Heritage "Gridiron Collection" Player-Worn Pro-Bowl Jersey Card featuring JEVON KEARSE of the Tennessee Titans. Serial #038/999. NM or Better. COMBINED SHIPPING: $2.95 for the first card or lot. All other cards/lots won within a 7 day period will be Combined and shipped for FREE. Wait for invoice before paying. NOTE: EBAY prohibits combined shipping on orders that qualify for their Global Shipping Program. 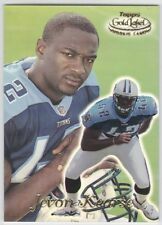 2004 Absolute Memorabilia Tools of the Trade #TT42 Jevon Kearse 19/25 Mint! !